Considered as the founder of formal logic, Aristotle is also known for establishing quite a few tenets of zoological studies and the scientific method of investigation. Simply put, while we tend to characterize Aristotle as an eminent ancient Greek philosopher (which he certainly was), his various treatises and influence arguably touch upon most avenues of human knowledge, with fields ranging from metaphysics, ethics to economics and politics. In that regard, Aristotle, along with his one-time teacher Plato, is often considered as the ‘Father of the Western Philosophy’. Born in circa 384 BC in Stagira, in the coastal Chalcidice region of northeastern Greece, Aristotle belonged to a fairly upper class family – since his father Nicomachus was the personal physician to King Amyntas of Macedon (grandfather of Alexander the Great), the founder of the unified Macedonian kingdom. Unfortunately, for young Aristotle, both his parents died when he was about thirteen (or ten). Consequently, Proxenus of Atarneus took up his guardianship and paved the way for Aristotle to take up the mantle of a philosopher – with the teenager, at the age of 17 or 18, being sent to continue his education at the famed Plato’s Academy in Athens. 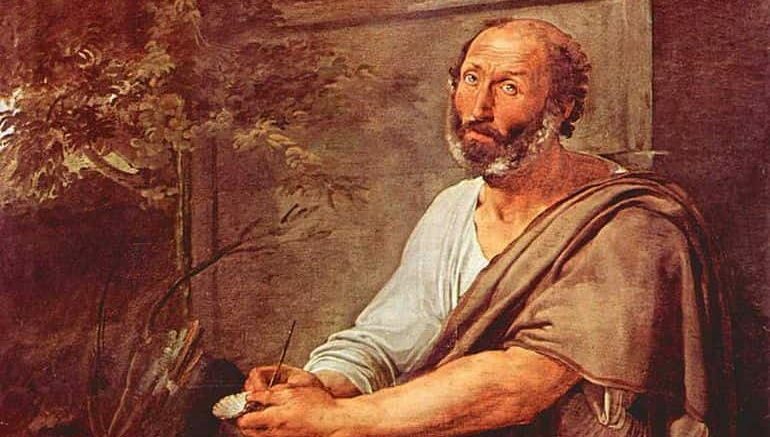 Interestingly enough, while not much is known about this phase of Aristotle’s life, some hypotheses suggest how the would-be philosopher, during the teenage years, even spend his time inside the confines of the ancient Macedonian palace. In essence, such a conjecture does allude to Aristotle’s often warm relations with the Macedonian court and aristocracy. The next phase of Aristotle’s life was devoted to studying and attending the lectures of Plato for nearly two decades. Some accounts also suggest how Aristotle, an exceptional student by contemporary standards, was himself beginning to take active part in lectures and teachership, especially on rhetoric and dialogue, during the latter part of the twenty years – so much so that his ability fueled the possibility of his pre-designation as Plato’s successor at the Academy. However, after Plato’s death in circa 347 BC, the titular element of the successor passed down to Plato’s nephew Speusippus instead of Aristotle. According to historians, there might be two reasons for the outcome. 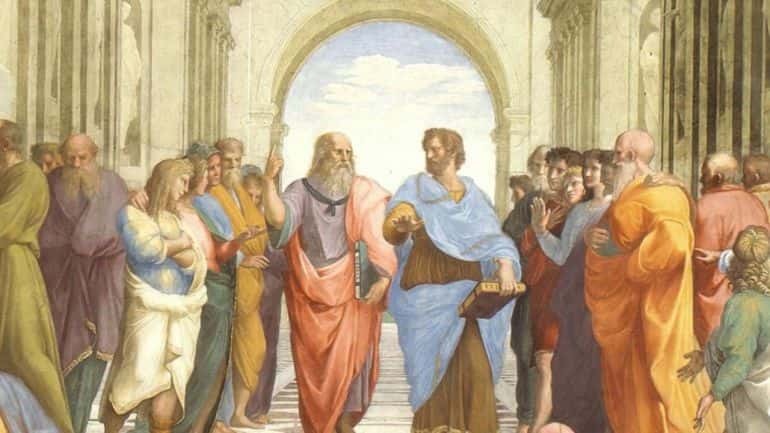 The first theory relates to how Aristotle’s views already started to diverge from that of Plato, thereby curtailing the chance for the succession. The second conjecture relates to nascent political reasons, with the anti-Macedonian sentiment growing in Athens during the reign of King Philip II (father of Alexander). To that end, it is certainly possible that Aristotle, known for his close ties to Macedonian aristocracy, already left Athens before the death of Plato, by circa 347 BC. And his destination to Asia Minor could have even been a directive from Philip II himself, as means to bolster Macedonian influence in the Greek cities of Anatolia that recently revolted against the Persian rule. Thus after leaving Athens, Aristotle traveled with his friend Xenocrates (another Greek philosopher and mathematician) to the court of Hermias of Atarneus – who was the ruler of Atarneus and Assos in Mysia (situated in northwest of Asia Minor) and also a one-time student of both Plato and Aristotle. Aristotle probably even married Pythias, the niece of Hermias, but the familial relationship between the king and the philosopher came to an untimely end with the Persians re-establishing their dominance in the region. In the ensuing struggle, Hermias was possibly captured (and later killed), while Aristotle had to retire to the relativey safety of the island of Lesbos. And during that time, he continued to conduct his empirical experiments on both zoology and biology, along with philosophical researches. 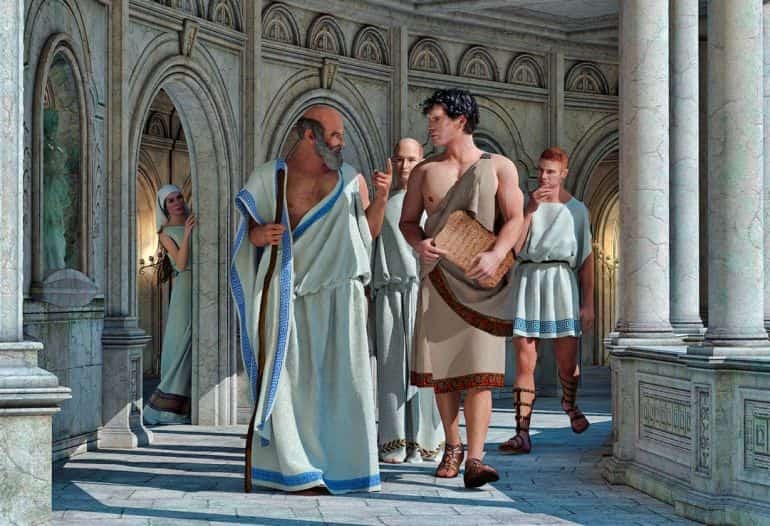 However, by circa 343 BC, Aristotle once again came out of the ‘retirement’, as he was officially summoned by none other than King Philip II of Macedon. 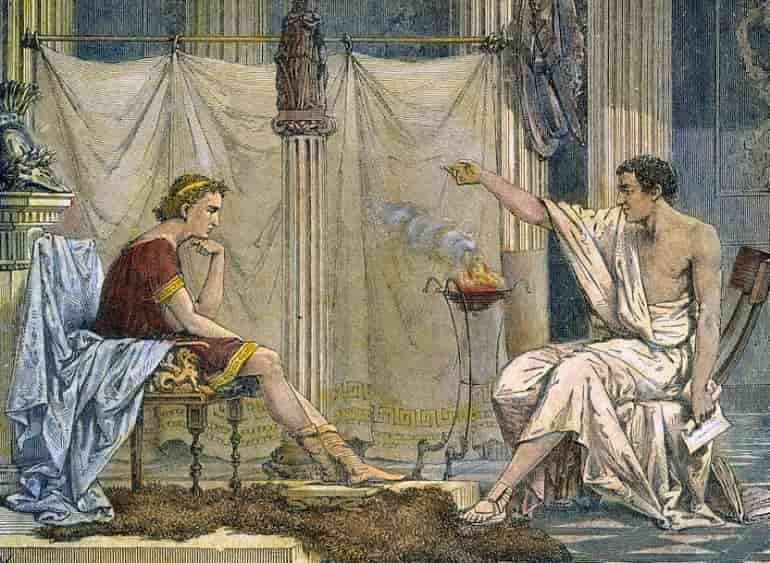 Once inducted into the Macedonian court, Aristotle served not only as a tutor to Alexander – the future conqueror of the Persian Empire but also as a teacher to future kings of the Hellenistic era – Ptolemy and Cassander. Furthermore, he was accorded the honorable title as the head of the royal academy of Macedon. Unsurprisingly, during the tenure, Aristotle was known for proclaiming his ethnocentric views (that were resonantly anti-Persian), given his own familial complications resulting from the Persian intrusion in Asia Minor. In circa 335 BC, after Philip’s death, Alexander was already primed as the Macedonian king. Aristotle, by-then known as an influential philosopher, completing his designated tutorship (to Alexander), returned to Athens and established his own school – the Lyceum. In the following twelve years, he probably composed the majority of his 200 works (of which only 31 survive), while also playing an active role in teaching at his own school. Pertaining to the latter, it was common knowledge among the students at the establishment that Aristotle had the habit of walking about as he discoursed – known as peripatetikos (or peripatetics). During the period, after the death of his official wife Pythias, Aristotle also fathered a son named Nicomachus, from a relationship with his mistress (or slave) Herpyllis of Stagira. Interestingly enough, towards of the end of Alexander’s short life, the Macedonian conqueror was estranged from his erstwhile teacher Aristotle, possibly because of the former’s inclusive policies entailing both the Persians and other Greeks. But in spite of the souring of their rapport, many notable Athenians, like Eurymedon (one of the overseers of the Eleusinian Mysteries), rebelliously denounced Aristotle on the basis of his ‘impiety’ and ties with the Macedonian aristocracy. 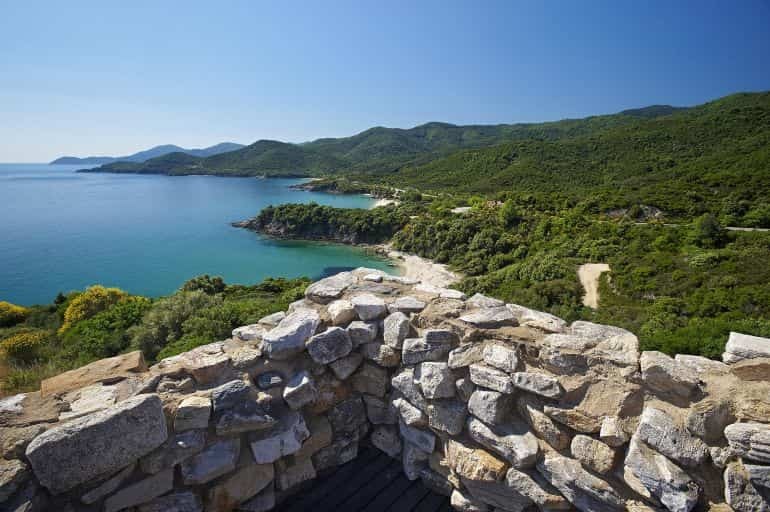 Consequently, a year after Alexander’s death, in circa 322 BC, he was forced to flee to his mother’s family estate in Chalcis, on Euboea. 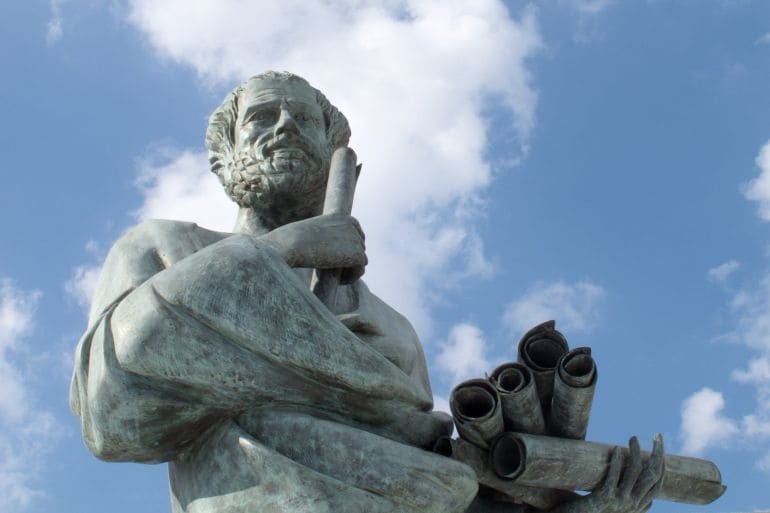 On reaching the haven, Aristotle famously proclaimed – “I will not allow the Athenians to sin twice against philosophy”, which refers to the earlier execution of Socrates in Athens due to his controversial views. Later on, in the very same year, Aristotle breathed his last, probably dying from natural causes (or digestion problems) at the age of 62. 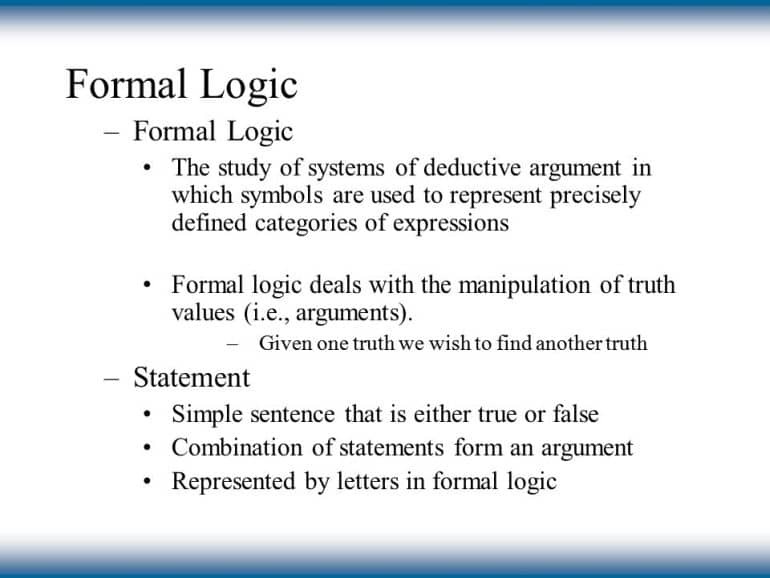 Aristotle’s works on ‘logic’ are compiled into six books collectively known as the Organon (many of which were modified and edited later by his students and other ancient Greek lecturers), and Prior Analytics, as one of them, is often regarded as the earliest known study of formal logic. Quite intriguingly, Aristotle himself probably labeled the work as ‘analytics’, while his perception of ‘logic’ was conflated to dialectics. 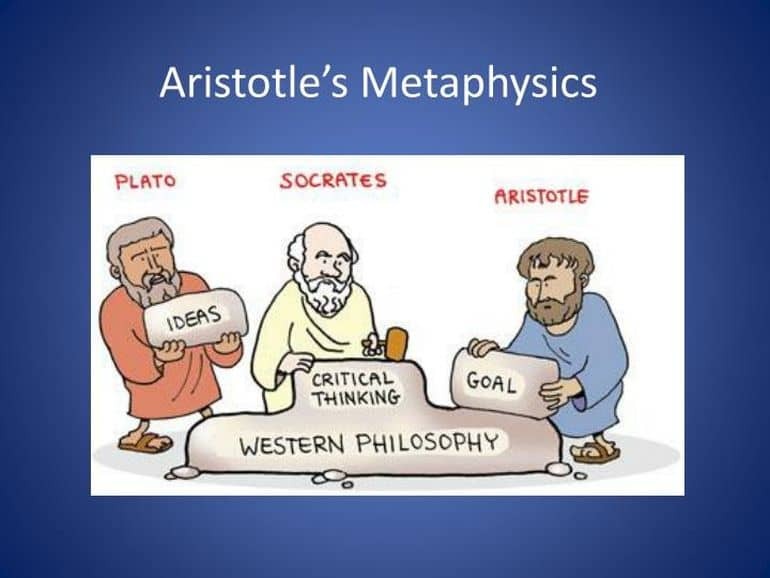 ‘Metaphysics’ as a term was probably coined by later editors of 1st century AD, who compiled the various theoretical works of Aristotle that the original creator termed as first philosophy. The term possibly alludes to how its scope went beyond the physical studies conducted by Aristotle. As for its focus, Aristotle talks about the nature of existence when perceived from a fundamental level (i.e., the ‘true substance’), as opposed to existence defined by physical characteristics (like a triangle existing because of its angular lines). Take, for example, a bronze statue. Its material cause is the bronze itself. Its efficient cause is the sculptor, insofar has he forces the bronze into shape. The formal cause is the idea of the completed statue. The final cause is the idea of the statue as it prompts the sculptor to act on the bronze. The final cause tends to be the same as the formal cause, and both of these can be subsumed by the efficient cause. Of the four, it is the formal and final which is the most important, and which most truly gives the explanation of an object. The final end (purpose, or teleology) of a thing is realized in the full perfection of the object itself, not in our conception of it. Final cause is thus internal to the nature of the object itself, and not something we subjectively impose on it. To Aristotle, God is the first of all substances, the necessary first source of movement who is himself unmoved. God is a being with everlasting life, and perfect blessedness, engaged in never-ending contemplation. 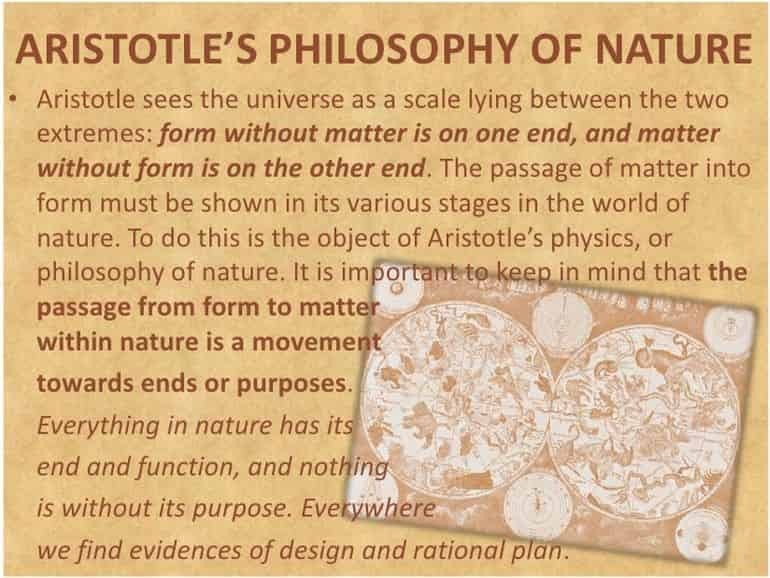 Among Aristotle’s other theoretical works, his treatises do cover a spectrum of subjects, ranging from zoology, astronomy to geology and physics – mostly compiled under the section of Natural Philosophy. One fascinating (and rather correct) observation of Aristotle in the field of astronomy relates to how he pointed out that the “size of sun is greater than that of the earth and the distance of the stars from the earth many times greater than that of the sun, then… the sun shines on all the stars and the earth screens none of them”, thereby refuting the pre-Socratic claim of how the stars in the Milky Way are shaded from the Sun’s rays by the greater mass of the Earth. On the other hand, like many of his contemporaries, Aristotle (wrongly) believed in the geocentric model of the solar system. Concerning physics, Aristotle particularly made observations on motion and how it both affects the quality of a substance and also relates to the locomotive scope of objects. Pertaining to the first part, it becomes apparent that the philosopher regarded time as a measure of motion, given its role in the beginning phase and final outcome of a substance. Essentially, time was perceived as being depended on motion, with no change in the universe equating to no time. As for the second notion, Aristotle talked about the more primary aspect of motion in line with Classical mechanics – like heavier objects requiring more force to move, while objects affected by greater force tending to move faster. Quite fascinatingly, Aristotle also dabbled in the discourse of biology, with his works (entailing both data gathering and discerning patterns) mostly based on the fauna of the Lesbos island – researched during the two years after his unceremonious exit from Asia Minor. There he studied and noted the variation of animal physiology based on their natural habitats, but disregarded the effect of evolution (or mutations) as we understand the concept in our modern era. 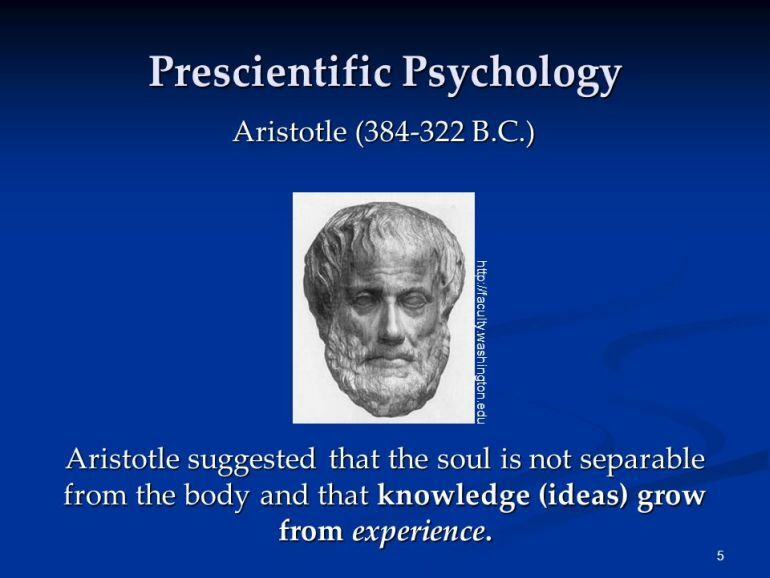 The ‘soul’ was the focus of Aristotle’s treatise On the Soul (peri psychēs). One of his notions prescribed the hierarchy of scale in beings, or basically the ‘soul’ or life-force of organisms. In this categorization, plants belonged to the lowest scale by virtue of their nutritive element (vegetative soul), while animals belonged to a higher scale with their appetitive (or sensitive) nature. The humans were considered the highest on the scale since they have both nutritive and appetitive features, while also possessing the unique ‘power’ of rationality – the combination of nous (intellect) and logos (reason). Aristotle additionally talked about memory in the aforementioned treatise by mentioning how it is a result of a complex stimuli that is not comprehended at that instant by the nervous system. Consequently, he goes on to describe memory as serving as a mental template (of a perceived experience) or an impression that the mind can retrieve (or revert to) in the future through sensation and other mental channels. Aristotle also touched upon the subjects of imagination and dreams, by defining the former as “the movement which results upon an actual sensation.” In essence, he interpreted that ‘imagination’ was rather a vehicle for memory, since it was the process through which human mind registers the impression of senses. Similarly, he postulated how dreams (and illusions) also involve sensations, albeit from lasting impressions gathered during the waking phase. 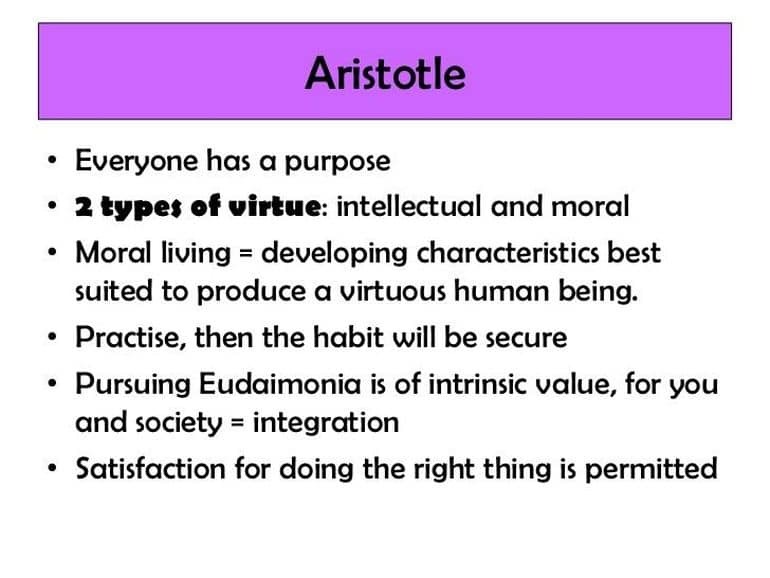 Deviating from Plato’s “self-existing good”, Aristotle based the principles of ethics on practicality – as can be gathered from his work Nicomachean Ethics. Furthermore, he specified how ethics is intrinsic to humanity – much akin to the purpose (or function) of the individual, defined as the “activity of the psuchē (soul or spirit) in accordance with reason (logos)”. This optimized activity of the ‘soul’, which traverses both excesses and deficiencies, becomes the aim of the eudaimonia – the state of ‘well being’ (or roughly translated as ‘happiness’). As for his treatise aptly titled Politics, Aristotle made the famous statement – “man is by nature a political animal”. To that end, he posited that a community of humans rather reflects humanity’s sense of ethics and morality on a collective scale – as it serves as a vehicle for furthering protection and development of other humans. Consequently, he considered the city or polity as the most important institution for the individual, followed by the family. The legacy of the rather informal institution of Lyceum (Aristotle’s school) was carried forth by the Peripatetic school, which was important during the Roman period (till circa 3rd century AD) and played an instrumental role in continuing (and expanding upon) many of the conceptions and investigative methods originally put forth by Aristotle himself. By 6th century AD, the Eastern Roman Empire inherited the tradition of philosophical discourse, with the leading role being played by the Christian Greek scribes who worked tirelessly over generations to copy and compile the extant manuscripts of Aristotle’s works. Quite intriguingly, Aristotle was also held in high regard in the Islamic world, with a significant number of his ancient Greek commentaries being actively translated (into Arabic) and assessed by medieval Muslim philosophers and scientists. And while, the influence of Aristotle was somewhat mitigated in Western Europe during the early medieval period (possibly due to the dissociation with the Greek realms), 12th – 13th century brought forth the translations by James of Venice and William of Moerbeke and the works of Thomas Aquinas (like Summa Theologica), with the latter considered as one of the pillars of ‘synthesis’ of Aristotelian principles and Christian theology. However, there were quite a few late medieval and early modern thinkers and men of science who went on to critique (and even dismiss) some of the Aristotelian notions. For example, noted 17th century English physician William Harvey disproved Aristotle’s notion about the heart (as the seat of the ‘soul’) by establishing how the organ biologically functions as a pump. Similarly, Galileo disregarded the geocentric model and the mass-motion relation originally conceived by Aristotle. On the other hand, some eminent 19th century thinkers and scholars, including philosopher Friedrich Nietzsche and mathematician George Boole, did their part to praise and support various Aristotelian conceptions like formal logic and ethics.